I’ve got some illustrations from that book to share here this morning, this book which is a must-have for any Ceccoli fans. I’ve had Beautiful Nightmares for a while and have been wanting to share some of these images, but last week I stumbled upon this below video of Nicoletta speaking about her work — in celebration of an overseas exhibit of hers. (She’s speaking in English, incidentally; at first I thought I’d be seriously out of luck and just guessing on the Italian.) So, I thought today I’d share the images along with the video. 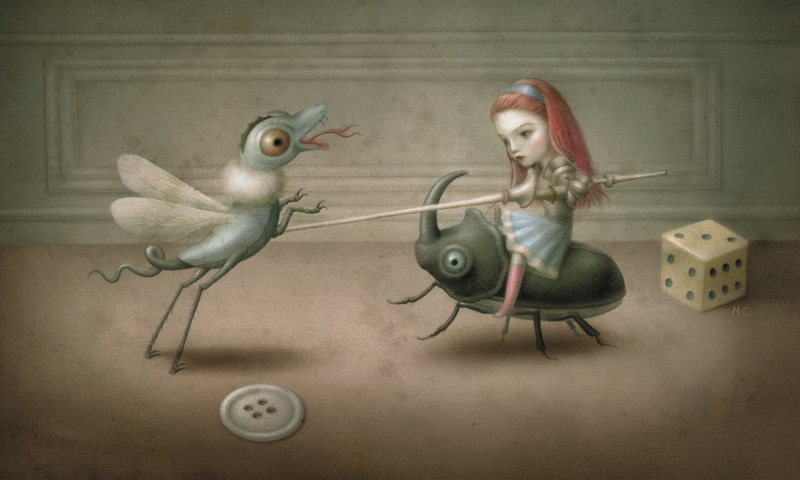 I believe Beautiful Nightmares is the first collection of Ceccoli’s work. If you’re a fan, you’re in for a treat. It’s stunning, all her luminous, surreal images in one thick volume. 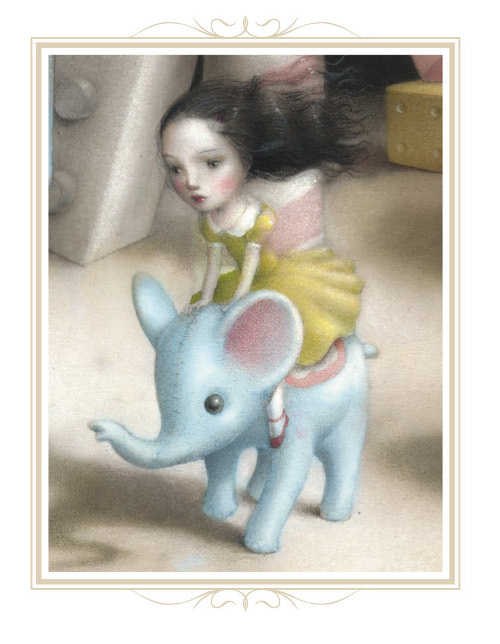 In last year’s post about A Dignity of Dragons, I noted Kirkus’s words on the matter of looking beyond what you see on the surface when it comes to Ceccoli’s work: “Every figure is pretty,” they wrote, “but the illustrator staves off preciosity by injecting plenty of drama into her compositions.” She’s also not afraid to disturb. Or surprise. Or send you into a fairy-tale wonderland reverie of one sort or another and then jolt you out of it. It is a mysterious, sometimes dark whimsy, this world of hers. Here is the video—Nicoletta musing on beauty, cruelty, fragility, not wanting to grow up, and throw in some monsters and impending threats, too—followed by a couple more images. Anyone wanting to see more of her artwork would do well to simply google her name. There are many of her portfolios at various places online. BEAUTIFUL NIGHTMARES. 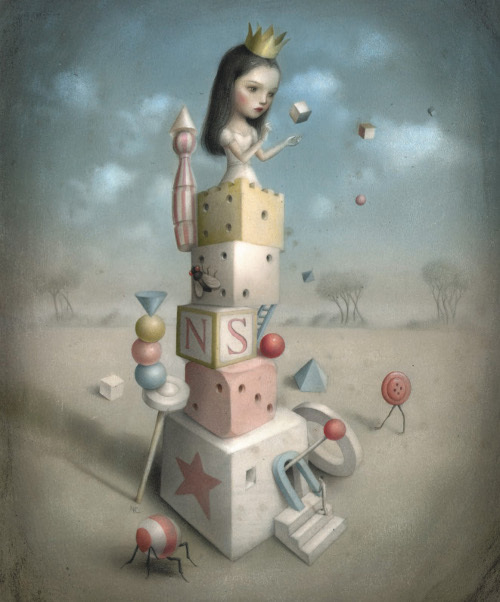 Copyright © 2010 by Nicoletta Ceccoli. Published by Soleil Editions, Paris. All images reproduced by permission of the publisher. Incredible. Thanks for sharing these. Luminous is a good word – they’re drawn softly and beautifully and are so filled with oddity and shadows. Lovely stuff. 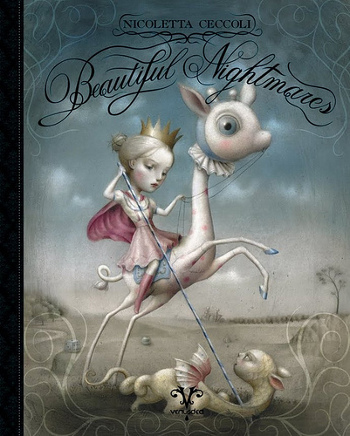 I absolutely adore her work and hope to get my hands on Beautiful Nightmares. what a wonderful post, thank you for sharing that video. Mesmerizing – her art, and her accent. Love it. Thank you. I LOVE her work – her Red Riding Hood was spectacular. I’d love to see her illustrated Alice’s Adventures in Wonderland, wouldn’t you? The book is pricey, but well worth it, if you’re a fan. Luminous, yes! Love how they contain opposing feelings/forces/themes, so beautifully rendered. They go well with Innocence Mission and this rainy day, no? Your work has delicate nature with a fierce underbelly. I think I’m in love. We’ve been fans of her art for years, but I had never heard her speak about it…mesmerizing! How wonderful! She is beautiful and fascinating! Thank you for sharing the interview as well as the artwork!